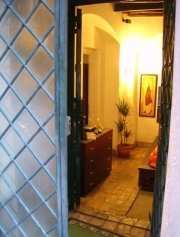 A 50 METRES FROM PIAZZA AND BRIDGE TRILUSSA SISTO, a few minutes from the most important sites of cultural and artistic interest of Rome, as Campo dei Fiori, Piazza Farnese, Piazza Navona, San Pietro and the Vatican City. The privileged position of HOUSE NANDO can reach on foot or by tram No. comfortable 8-3, line H and 780 bus some of the most coveted of the eternal city: St. Peter's Basilica, the Vatican Museums, Piazza Navona and the even more famous Piazza of Spain. They are also within walking distance numerous restaurants, typical, pubs, supermarkets and nightclubs. The house is picturesque in every corner, a typical apartment as a whole reminds us of our Rome disappeared. Beams and rustic furnishings complete with every comfort allieteranno your stay. Take the train metropolitan FM1 until the station area and from there the Tram No. 3 on ° 8 (5 stops) to get off bridge garibaldi from them 100 metres you are in the square and take trilussa alley moroni to 10 mt from the square. And 'A bus service train to Ciampino airport from which, every 15 minutes, from the train to Rome - Terms. Take Bus H 5 stops down bridge garibaldi, proceed on foot for one hundred metres to Piazza trilussa and take alley moroni to 10 mt from the square. Traversing the entire stretch of urban A24 up to take the ring Tiburtina direction EUR-S.Giovanni. Continue for 1.2 km and take Viale Castrense. Traversing 512 Viale Castrense for me to turn left onto Via Caltagirone. Continue for 150 m to the junction with Via La Spezia, turn right and proceed to 650 m up to Largo Brindisi and from here to 150 m to Piazzale Appio. Turn right (under the arches) and continue for 130 m to Piazza di Porta San Giovanni, turn left and continue for up to 275 m Piazza di San Giovanni in Laterano. Continue to Piazza San Giovanni in Laterano 285 for me take Via Dell'Amba Aradam. Continue for 570 m to Piazza Di Porta Metronia. Continue for 93 me turn left onto Via Drusus. Continue for 279 me turn right onto Largo Of Victims Of Terrorism-Viale Delle Terme Di Caracalla. Traversing the entire 789 avenue for me to turn left onto Di Piazza Porta Capena continued to 221 m.
Take Aventine Avenue and proceed to 426 m to Piazza Albania (Palace BNL). Continue to take me 76 Viale Manlio Gelsomini, continue for up to 410 m Via Galvani and go for 502 m.
Turn right and continue along Via Benjamin Franklin for 132 m.
Turn left and continue along Via Aldo Manuzio to 201 m.
Turn left and continue for Lungotevere Testaccio for 115 m, turn right and continue on Ponte Testaccio to 156 m.
Turn right, follow Lungotevere Portuense to 129 m.
Continue along Via Nicholas Bettoni for 147 m.